Cimbrian, it is said, was a unique language in that it contained a tense which was used to describe a person or object which had gone missing or been lost: neither present nor past, still existing in a space or time which no non-Cimbrian can ever properly comprehend. A number of critics and translators are currently at work on Orkkut's books, her manuscripts now inhabiting the realm of that unique Cimbrian tense. Identified as a Bothno-Ugaric language, "Cimbrian" may be referencing the same language known in Italo Calvino's quarters as "Cimmerian," described by Professor Uzzi-Tuzzi as "a modern language and a dead language at the same time." I treated myself to this lovely volume at Christmas, to add to my shelf of weird dictionaries. This collection of 52 lives, by turns tragic and comic, easily lends itself to browsing; I reach for it for inspiration, for reminders, for warnings. The introduction alone is worth the price of admission, exploring the concepts of erasure, "faith in the ineffable," linguistic negation, "literature of the unword," "stories that would prefer not to." Biographile: "The simple fact is this: books are real; writers aren't." PopMatters: "It's questionable whether insanity is a prerequisite for the arts." 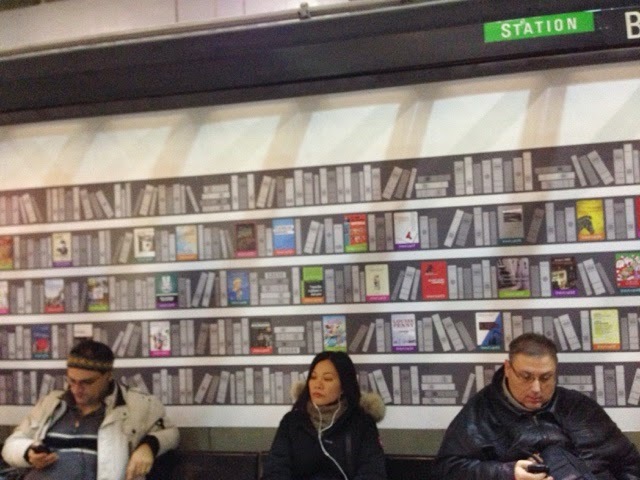 Montreal metro stations this week have been filled with bookshelves, stocked with virtual books. 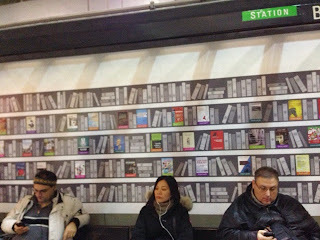 In a campaign cosponsored by various transit commissions and library associations, the commuting public is being encouraged to read. First chapters of 60 books that span genres are available for free for instant download, just by scanning a smart code or entering a URL (or they can be accessed from the campaign website). The books are available in French only (I believe Louise Penny bears the distinction of being the only English-language author on the list, in French translation). So far it's inspired fun waiting times when I'm with my daughter (and therefore not actually reading): "Oh, I read that," "That book looks interesting," and infinite I Spy possibilities. But I may yet download a chapter of two to practice my French. Transit-goers may or may not be getting the point — it's really heard to tell what they're doing on their phones. I'd love to see the download and usage stats at campaign's end. The following days were strange. It was as is until then we had all been dreaming and had suddenly woken to real life, although occasionally it seemed to be the other way round, as if we had all been plunged into a dream. And we went on living day by day in accordance with the abnormal conventions of the dream-world: anything can happen and whatever happens the dreamer accepts it. Movement works differently. We move like gazelles or the way gazelles move in a tiger's dream. 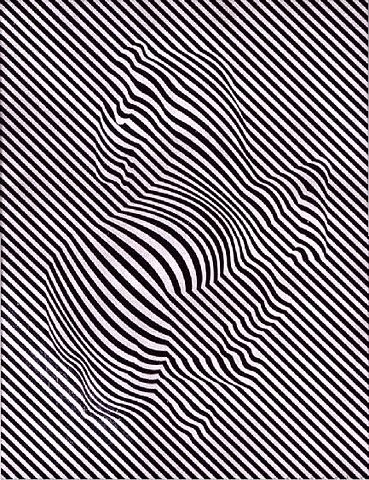 We move like a painting by Vassarely. We move as if we had no shadows and were unperturbed by that appalling fact. We speak. We eat. But underneath we are trying not to realize that we are speaking and eating. I reread this book for book club; in fact, I'd suggested it. What strikes me now is that for a book whose jacket copy touts the "clandestine view of the strange bedfellows of Church and State in Chile," there's remarkably little church in this novel, and not very much politics either. The politics that are there are presented nonjudgmentally; it'd be impossible to peg the narrator, or the author, as a leftist or otherwise on the basis of this text. 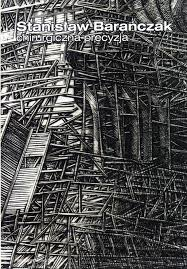 It strikes me also that this novella is in many way 2666 in miniature, with its lit critics and German writers, spaceships (yes) and labyrinthine torture basements. "An assortment of fruits and vegetables worthy of Archimboldo." The cultivation of art alongside some horror. 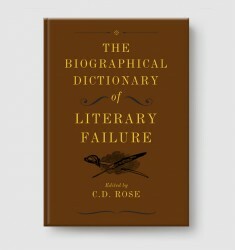 What the narrator expresses in the excerpt above, as well as in some of the anecdotes throughout the book — in particular, that of the Guatemalan painter in Paris, and the shoemaker whose dream of Heroes' Hill became his own crypt — where lassitude meets boredom, and a glimpse of immortality catalyzes it into some form of existential ennui, is some infernal detachment haunted by a secret knowledge. "That's how literature is made." "It's good to love. It's bad to be impressionable." Man is a rope stretched between the animal and the Superman — a rope over an abyss. — from Thus Spake Zarathustra, by Friedrich Nietzsche. I've had trouble reading lately. Doing much of anything really. I can't focus, yet I need to distract myself. Enter Jenny Offill's Dept. of Speculation. It's damn near the most perfect book I could've hope for, for my here and now. "The wife is praying a little. To Rilke, she thinks." It mirrors my reality, so that I may reflect upon it. I want to read it again immediately. It's the story of love and marriage and a lovely daughter, and betrayal. I also was not a good wife. I also go to yoga to cry. She has wanted to sleep with other people, of course. One or two in particular. But the truth is she has good impulse control. That is why she isn't dead. Also why she became a writer instead of a heroin addict. She thinks before she acts. Or more properly, she thinks instead of acts. A character flaw, not a virtue. It's so hard to be kind. In the history of the novel, female adulterous desire has been a major force, female jealousy a minor one. The wife's pain and sorrow are rendered through a wryer brand of observation as she becomes the betrayed. It is easy to feel for her because she is a desperately interesting character. Each newly disclosed flaw only makes her more compelling. In fact, we know everything about the wife and how she thinks and feels and moves through the world. It is much more difficult to feel anything about the marriage because the husband is so secondary a character. He is an accessory and a bit player in the wife's meditations. If it is a distressed account of a marriage in distress, it is also a poem in praise of the married state. If it brutally tears apart the boredom and frustrations of parenthood, it also solidly inhabits the joys and consolations of having a child. If it laments the work not done, the books not written, the aspirations unfulfilled, it also represents work well done, a book written, the fruit of aspiration. [...] It is often extremely funny, and often painful; earnestly direct but glancingly ironic, even whimsical. Jealousy everywhere. I'm living and breathing it. I read Alain Robbe-Grillet's Jealousy several years ago. I never got around to reviewing it here, but I recall noting that I might've interpreted it rather differently if it weren't for its title, if I hadn't known what it was supposed to be about. It couldn't be read cold. A weirdly dispassionate telling was suddenly imbued with a passionate external interpretation. One of Toohey's more interesting findings is that a morbidly jealous person (as opposed to "normally" jealous) is especially zealous in seeking "visual evidence to confirm the truth of the way they are feeling"; Othello must see Desdemona's handkerchief. This visual element makes film a particularly suitable medium for expressing jealousy. He suggests that stalking also arises from the visual need. Toohey uses Robbe-Grillet's novel to illustrate a couple other points. 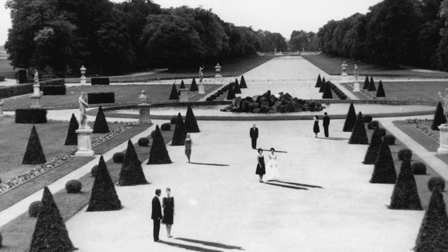 I'm a little hung up on this novel at the moment and want to revisit it, having just watched Last Year at Marienbad (for which Robbe-Grillet wrote the screenplay) the other week. Johnson also references Happy Are the Happy, a book of short stories by Yasmina Reza, which has just sky-rocketed to the top of my wishlist. Jealousy is exhausting. It's a hungry emotion. It must be fed. [...] Jealousy is a hungry emotion. Jealousy like information. Jealousy likes detail. That's why Instagram is such a hit. Proust actually links the language of scholarship and jealousy. When Swann is in his jealous throes, and suddenly he's listening at doorways and bribing his mistress' servants, he defends these behaviors. He says, "You know, look, I know you think this is repugnant, but it is no different from interpreting an ancient text or looking at a monument." He says, "They are scientific investigations with real intellectual value." Proust is trying to show us that jealousy feels intolerable and makes us look absurd, but it is, at its crux, a quest for knowledge, a quest for truth, painful truth, and actually, where Proust is concerned, the more painful the truth, the better. Grief, humiliation, loss: These were the avenues to wisdom for Proust. He says, "A woman whom we need, who makes us suffer, elicits from us a gamut of feelings far more profound and vital than a man of genius who interests us." Is he telling us to just go and find cruel women? No. I think he's trying to say that jealousy reveals us to ourselves. And does any other emotion crack us open in this particular way? Does any other emotion reveal to us our aggression and our hideous ambition and our entitlement? Does any other emotion teach us to look with such peculiar intensity? It is important if someone asks you to remember one of your happiest times to consider not only the question but also the questioner. If the question is asked by someone you love, it is fair to assume that this person hopes to feature in this recollection he has called forth. But you could, if you were wrong and if you had a crooked heart, forget this most obvious and endearing thing and instead speak of a time you were all alone, in the country, with no one wanting a thing from you, not even love. You could say that was your happiest time. And if you did this then telling about this happiest of times would cause the person you want to be happy to be unhappy. — from Dept. 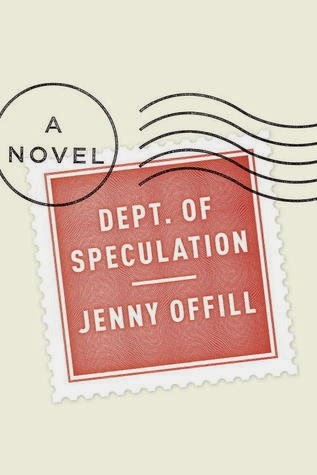 of Speculation, by Jenny Offill. I sometimes think I have a crooked heart. Stanisław Barańczak — poet, dissident, and translator — died last week. Here's a poem I found, translated by the poet himself with Clare Cavanagh. She cried that night, but not for him to hear. In fact her crying wasn't why he woke. It was some other sound; that much was clear. the sobs; she cries, but not for him to hear. the branch that tapped the roof. That much was clear. had said: "She's crying, not for you to hear." a quaking shoulder-blade. This much is clear. "Go back to sleep. What woke you isn't here. It was the wind outside, indifferent, clear." I quite love this poem already. It resonates with me because... it resonates. But here's the poem in Polish. The first stanza of the translation is, to me, strikingly different from the original. While everything else essentially matches up, the opening sets a very different tone. She cried that night, but it's not her crying that woke him. She wasn't crying for him, but it might've been about him. It was the wind, a rattling window pane, other people's odd business. So while the official translation maintains the rhyme, rhythm, matter-of-factness of the original, it turns on generality. There is something altogether more pointed and tragic about the original. She might be crying about him. I've always enjoyed comparing poems in translation, and I marvel at the translators' feat. It demands emotional precision more than technical exactitude. But to my ear, this English translation is a very different poem. Where is the damp pillow? A person's right to sleep at night? And now let us believe in a long year that is given to us, new, untouched, full of things that have never been, full of work that has never been done, full of tasks, claims, and demands; and let us see that we learn to take it without letting fall too much of what it has to bestow upon those who demand of it necessary, serious and great things. — from Rainer Maria Rilke, in a letter to Clara Rilke, January 1, 1907. Hear me, world. I demand necessary, serious, and great things.